It’s a good thing I attend only one Fancy Food Show per year — my waistline could not handle a second show! I’m supposed to be concentrating on coffee and tea products, but I cannot resist the plethora of delicacies from around the world available for sampling on every aisle. Cheeses from England, France, Greece, Italy, and the US (to name just a few); cured meats (bacon, pancetta, speck, jambon), roasted and grilled meats; breads; olive oils; pastas with myriad sauces; rice and grains (farro, couscous); wines; and so much more — not to mention the endless array of pastries, desserts, chocolate and candies galore…But I digress. I’m supposed to be talking about coffee and tea, of which there were plenty on display. On the tea side, while wellness and functional tea items remained popular like Vision from Numi Tea, a combination of guayusa hums with lemon verbena and ginger, and Power Breakfast from Stash Tea, a mix of black tea and mate, there seemed to be a greater selection of flavour-focused items. Twinings new teas included Buttermint, Earl Grey Jasmine and Lemon; while Stash had Maple Apple Cider and Salted Caramel Mate Herbal & Black Tea; Numi had Cardamom Pu-erh and Taylor’s had Blackberry Raspberry Tea, among the companies’ many offerings. Tea companies also highlighted fall and Christmas flavours like Pumpkin Spice, Christmas tea, Winter Spice and Holiday chai. Coffee companies also seemed to shy away from touting the specific origins and altitudes (there were some), but did promote that the beans were 100% Arabica, and organic, Fair Trade- or Rainforest Alliance-certified when applicable, and flavoured-coffees also remained popular. Some coffees had catchy names like “Velvet Hammer” that was a “smooth blend of Central and South American coffees” (although the person at the booth said the beans were from “Central and South American countries like Colombia and Papua New Guinea” so I’m suspicious given the lack of geography skills) or “Joe,” a simple, bold, robust everyday coffee. Like tea, fall and holiday flavours abounded (Pumpkin Spice, Santa’s Blend, Christmas Coffee, etc). 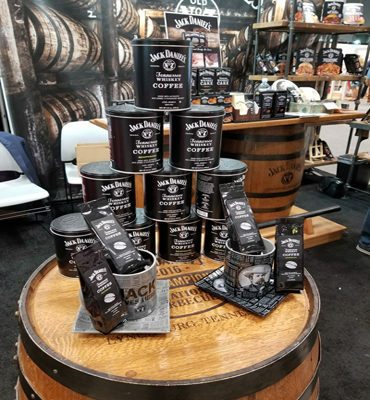 But two notable flavoured-coffees stood out—World of Coffee’s Jack Daniel’s Coffee and White Coffee’s Jim Beam line of coffee, that were both introduced recently and were making their Fancy Food Show debut. Jack Daniel’s is 100% Arabica and made with authentic Tennessee Whiskey and is available in regular and decaffeinated ground coffee. Jim Beam features a Signature Dark Roast, Cinnamon Stick, Bourbon Vanilla and an Original. The Jim Bean line is available ground or in single serve cups. The coffees are non-alcoholic but, according to both World of Coffee and White Coffee, the essence of the bourbon flavour remains. 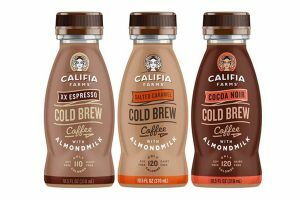 (White also offers a line of Kahlua-branded coffee.) Both lines are reportedly being well-received. But I’ll be curious to see if the purchases are for everyday consumption or more for gift-giving. 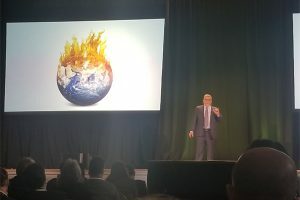 The Fancy Food Show was quite different from the recent World of Coffee where origins, altitudes and every flavour note and nuance from the terroir was infinitely discussed (I did not attend World Tea Expo this year but from my past experiences, it is the same philosophy). 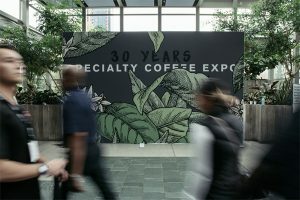 But as the coffee and tea worlds have shown, there’s a place for both types of consumers – the “purests” and those who love their flavours – and companies must continue to meet the demands from both consumer groups.